I didn’t have any expectations of Israel, since I had never thought much about traveling there. The only books I had read about the area didn’t have anything to do about visiting (The Peace to End All Peace: The Fall of the Ottoman Empire and the Creation of the Modern Middle East by David Fromkin, and Bible and Sword: England and Palestine from the Bronze Age to Balfour by Barbara Tuchman. I recommend both). 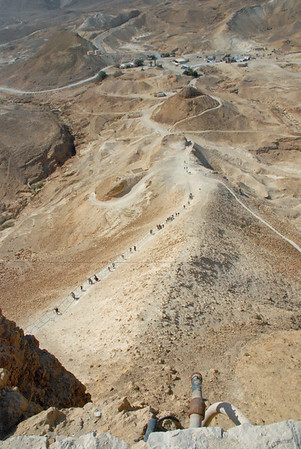 My travel group, put together by Jeff Wagg at College of Curiosity Field Trips, traveled out of Ashod and went to Masada, which can briefly be described as the Jewish Alamo: a myth, based in fact, that becomes a sacred narrative that we use to explain experiences, ideology or shared culture. 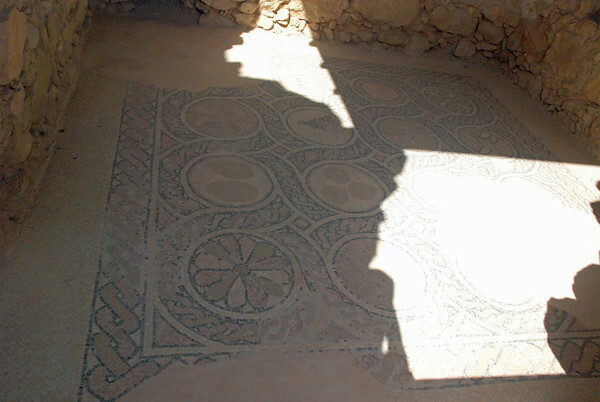 Originally built by Herod the Great (King of Judea 37 to 4 BCE), later serving as a Byzantine monastery, it remained unoccupied and forgotten for 13 centuries. 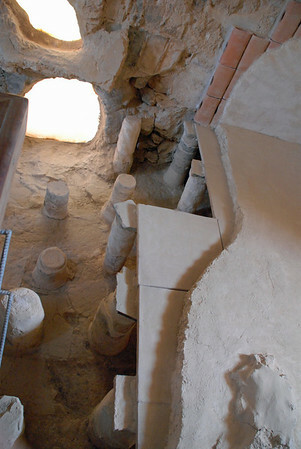 An excellent summary of the site can be found on the UNESCO World Heritage site here. There is a trail from the bottom of the site, but due to the heat of the desert and the distance, you aren’t allowed to start up after early morning. 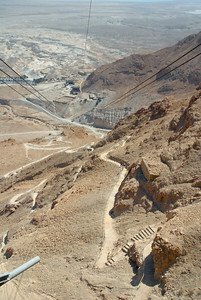 We elected to take the tram to the upper level. Our tour guide Eitan with R.E.J. 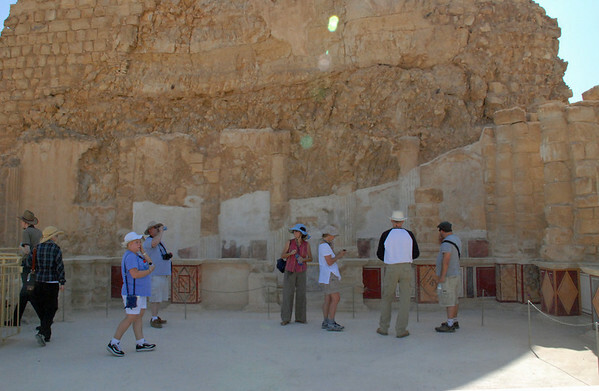 Tours, led us through the archaeological ruins at the top, and told us the ‘official’ story of the defenders of Masada and their mass suicide rather than face capture by the Romans. He also filled us in on what the currently known information is, including that the defenders, a marginal sect of Jews known as the Sicariis who differentiated from the Zealots by attacking not only Romans, but other Jews. 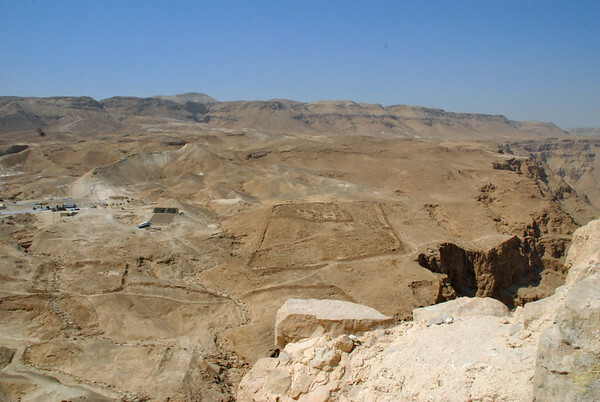 They ended up at Masada; the Romans lay siege and then built an impression dirt-and-rock embankment to the top. When they finally broke through, none of the defenders were found alive. The official story is that over 900 people committed suicide, but only about 30 sets of remains were found. However, the story is important. 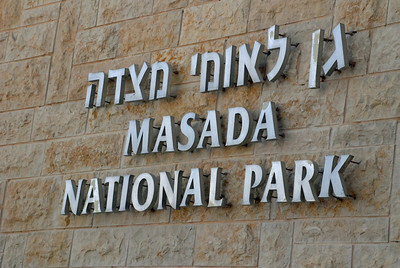 Jewish school children come here on field trips. Indeed, half of the country seemed to be here. 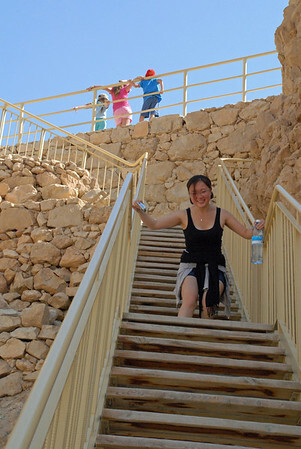 After a tour of the top, we made our way on a staircase built into the side of the mountain, to reach Herod’s palace, also built into the side. I should mention that the stairs are built on the SIDE of the mountain, some carved into stone, and some as planks with handrails on either side. They wound around for several hundred feet, going up and down. It was a bit of a hike in the heat, but I have to applaud Paperskater on this one! She is afraid of heights, and sometimes nearly crawled on the steps, but she is a total trooper! She made it to the palace, because she didn’t want to miss the experience. The desert and the isolation preserved this place, and most of what you can see is original – the walls, the painted interiors, the tiled floors. Some areas have been restored to show how the site once looked, but most of it is exactly as it has endured through one thousand years of nature. To date, this is the oldest place I’ve visited that has much of the original structure. The place is otherworldly – you can see for many miles, but the view is desolate. Dry plains, dryer hills, and the flat blue of the Dead Seain the distance. Plastered wall at back of the palace. The brighter-colored stones on the right have been repainted to represent original colors. You can see faded versions at the back. We had lunch in the cafeteria, where the buffet meal consisted of the usual Middle Eastern shawarma type food, featuring chicken. 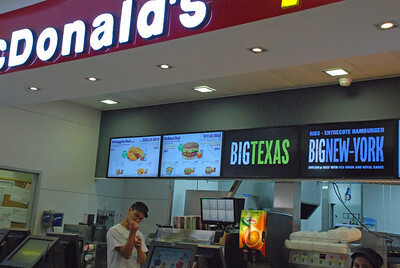 And, there was a McDonald’s, although I saw no bacon cheeseburger options. We next went to the Dead Sea. Other than the novelty of the water itself, the lake is not particularly inviting, but the area has the usual line of hotels, gift shops (packages of “therapeutic mud”, which people covered themselves with). We were given the warnings: do NOT get the water in your eyes, don’t enter if you have any cuts or wounds, if you accidentally swallow the water contact a lifeguard immediately, and unless you want to experience real pain, don’t pee in the water. Luciana reads her Kindle. No float mat needed! Once you wade knee deep, you are unable to remain standing. The water is so dense, your legs float to the top. The water itself has a very oily texture, slippery-slimy. I touched the edge of my tongue to a damp finger: salt and metal. As one of our group members said, the surreal experience of floating nearly on top of the water, unable to put your feet to the ground, was like being on another planet. 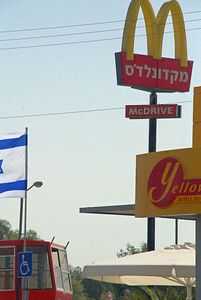 The photographs are impressive [especially of seeing McDonald’s written in Hebrew – kidding!] with informative prose. Thank you. It was a spectacular journey. I’m very happy to have been able to swim in the Dead Sea, but it was a somewhat creepy experience. There were jets of cold water coming from the bottom, and it looked like we were floating over craggy caves. I KNOW nothing lives in there, but man, my reptile brain was screaming “something is going to come up and grab you.” And then upon getting out, I felt like I had just taken a dip in some Italian dressing. Ew. I saw the same Roman bath technology at the Römerkastell Saalburg in Germany. 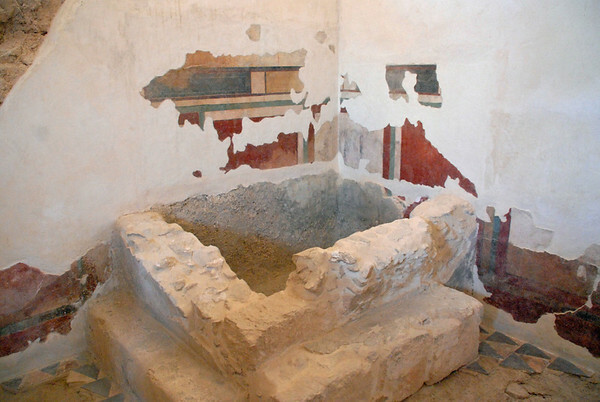 Was the bath a part of the fortress? If so, should I infer that Herod the Great was an assimilated Jew? 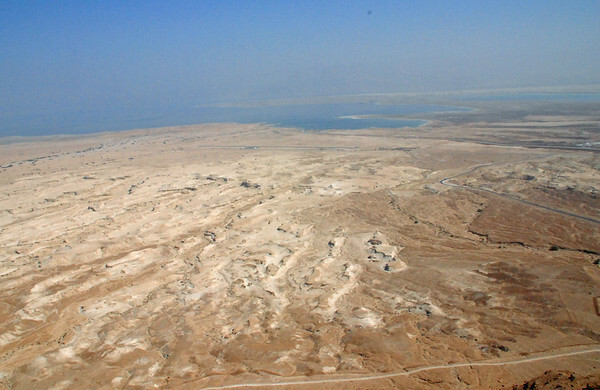 I just learned alot about the Dead Sea that I never knew. Your pics are really impressive !